So, I don’t know if anyone else has the same problem …but Gavin tends to take over when I cook roasts or chicken. This explains the poor selections of meats on the blog!!! It’s not due to the fact that he doesn’t trust me, but because he also loves experimenting. I don’t mind for the most part but once in a while I like to try. 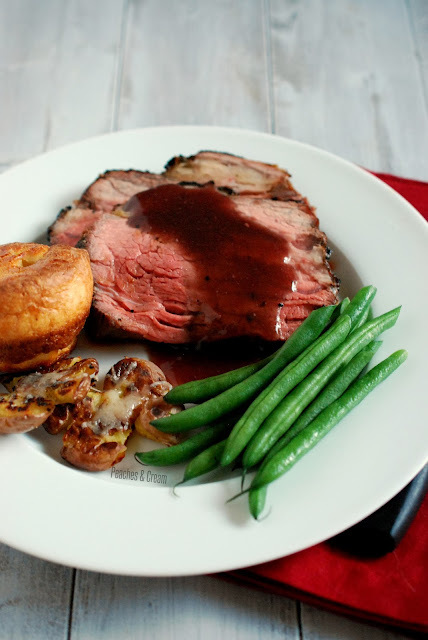 And I had such a huge craving for a roast the other day, I had to make it! Just a quick note regarding the temperature-I thought it was a little strange to cook it at such a low temperature, but it worked well. I checked the roast initially after 1 hour then at 45 minute intervals. I removed mine just before 140 degrees F, which is rare. 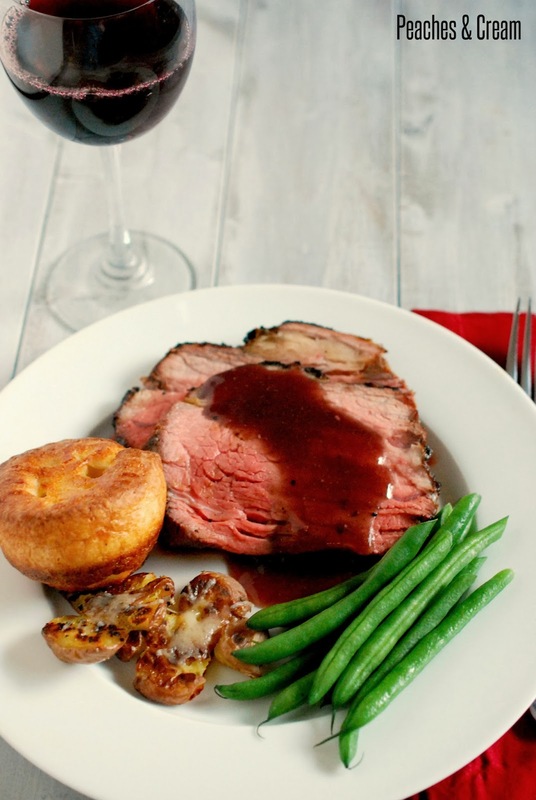 If you like your roasts medium then the range would be 155 degrees F. The roasts continue to cook after you remove it from the oven so take it out just before your desired temp. Happy cooking! xoxo. With a paper towel, pat the rib. Score ½ inch slits and insert the minced garlic (in about 12 places in the roast). Rub the roast with oil & sprinkle with sea salt & garlic powder. Massage the beef bouillon cube onto the entire roast. Sprinkle with pepper. Allow the roast to come to room temperature, about 60 minutes. Preheat the oven to 550 degrees. Adjust the rack so that there is about 4 inches of space between the roast and the coils. Place the roast on a roasting rack (fat side up, rib on bottom), and add 1 ¼ cup water on the pan. Roast for about 15 minutes, until you see that a brown crust has formed. Reduce the temperature to 200 degrees. Roast until it reaches just before 140 degrees, if you like it medium rare. Remove the roast from the oven & turn the broiler on. Wait for about 5 minutes and add the roast back to the oven, broil again for 2 minutes, watching carefully. Remove from the oven and wrap with aluminum foil (save the drippings!). Rest for about 15 minutes, this will allow the roast to cook until it reaches 140 degrees. In a medium-sized stockpot, place the drippings from the roasting pan and add the water, cabernet, cornstarch, garlic powder, pepper & salt over medium heat. Reduce by 1/3 and serve over the roast.